A couple weeks ago, I played through and reviewed the original Donkey Kong Land for Game Boy & 3DS VC. While the game was notable for featuring a brand new quest for our favorite Kongs, I had issues getting over the clunky stage design, slippery physics, muddled visuals and off-screen obstacles. I’m guessing Rare felt similarly at some point, because the sequel valiantly aims to iron out all those wrinkles to really make the adventure feel at home on the small screen. For the most part, they succeeded—right from the first stage, Land 2 feels significantly better, with Diddy and Dixie having all their console momentum and agility. It just feels more fun to bonk enemies this time around, which goes a long way in making DKL2 addictive and engaging. The improvements don’t stop there, though. The backgrounds have been dialed back a bit, making for improved visibility, the visuals have darkened the playable characters to make them stand out, and the stage design has gotten more involved and dynamic. A good example of the improved visibility at the cost of background detail. A smart trade-off, if you ask me. Here’s the thing about Donkey Kong Land 2. Unlike the first, it’s a port of a console game—in this case, Donkey Kong Country 2. And it’s a surprisingly faithful port—almost every stage from the original shows up in some form, albeit sometimes with some concessions. The story drops the funny fourth-wall approach from Land 1 and sticks to DK getting apenapped by K. Rool on Crocodile Isle. Most everything from DKC2 is present in some way, from the five Animal Buddies to the multitude of Bonus Barrels and DK Coins (most of which are hidden smartly). The entire quest took me almost six hours to 100%, which is just about as long as the console version. While it’s kind of awesome to be playing through a handheld version of Bramble Scramble, the stages do often miss some of their more dynamic moments (like the King Zing chase in Rambi Rumble) due to the Game Boy’s lack of power. 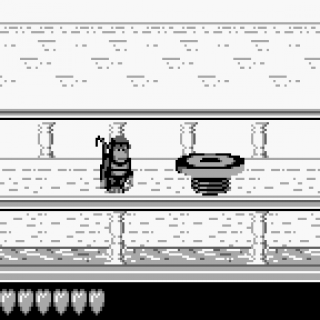 And if you’re familiar with the SNES version, this can be pretty noticeable. The fun variety of barrels, for instance (like the ones you can control in the Lost World’s fire level) are mostly gone, replaced with standard barrel blasting sequences, Animal Antics no longer cuts to different level themes, Haunted Hall has been replaced by a more generic roller coaster stage, Diddy doesn’t rap anymore, etc. I noticed that the stages aren't really built for speed-running anymore, despite the monkeys having a lot of nice momentum. Since the screen is smaller, you're forced to play a lot more cautiously, and this kind of messes up the Diddy/Dixie balance to me--Diddy feels less useful here, whereas I felt the chimps' abilities balanced each other well on the console version. The music fares pretty well for the most part. Over half of the classic level themes return in 8-bit form (including fan-favorite Stickerbrush Symphony), and the ones that don’t have their stage music use an existing song (for instance, the mine shaft now shares the Hot-head Hop theme with the lava levels). This usually works out pretty okay, with one big exception: the Lockjaw’s Locker theme shows up a lot early on. Normally reserved for just the water stages, this music also plays on the rigging levels, and for some reason, two of the three ship deck levels (the first stage has Snakey Shanty but it doesn’t show up after that). What this means is that in the first world’s five stages, you’ll hear the same music for stages 2, 3, 4 and 5. And then in the next world (which combines worlds 2 and 3 from the SNES), you’ll hear it again in four levels. And it really doesn’t fit the ship themes very well at all. Game looked pretty good on the original system. It’s a little hard to rate this game. On one hand, I had fun with its quest, and it fixed a lot of what was wrong with DKL1 (even if the off-screen enemy issues still reared their head from time to time). However, the number one issue with this game is also what makes it enjoyable: Donkey Kong Country 2. To put it bluntly, Land 2 is a downgrade in every way. You don’t have the team-up and up-throw moves, the music, visuals and (lack of) sound effects are a clear step downward, the stage design is often compromised due to the power of the system, the enemy placement is not as clever, and Kudgel’s boss fight has been removed. The only advantage it has is portability. DKL2 is $3.99 on the eShop, while DKC2 is $7.99; I’d definitely recommend just going the extra mile and picking up the SNES version to enjoy the game in its full glory. However, DKC2 super-fans would probably still want to give Land 2 a go to see the changes and try a slightly different Kong Quest than the one they’re used to. It still plays well enough, after all, and the bonuses and such are often scrambled around a bit. Ultimately, it’s definitely a stronger game than Donkey Kong Land 1—if it was released in a world without DKC2, my score would probably be a full point higher. But as a port that came after the original, it feels a bit…unnecessary when there’s a better version easily available. Thanks for the review! I thought about giving them a go but it seems like they are too much of a downgrade. I really hope Nintendo starts releasing GBA games for the 3DS and then I'll definitely buy the GBA ports. Do you already own the SNES DKC game(s)? This isn't a port of the SNES game. Still, the comparisons are almost unavoidable. Which is too bad, because taken on its own, DKL2 is incredible. I guess it sort of is a loose definition of "port." The level design isn't exactly alike, but it's structured very similarly. To take stage one as an example, they both take place on a ship's deck, gradually introduce a few enemies and objects, bring in Rambi near the mid-point, hide some secrets up above the barrel platforms, then take away Rambi for the final stretch. Lava Lagoon still has Clapper chilling the time-based water, Rattle Battle is still a ship-based Rattly stage with lots of pits and jumping crocs, and so on. I'd say it's a port insofar as it's what DKC2 would sensibly be like on the Game Boy. Which isn't a bad thing, as its source material is still excellent. Incidentally, I'm still waiting on kriswright's big DKC2 adventure thread! Don't think we've forgotten about it, bud! I own the first one on Wii U and I've finished both the first and second, before. In that case, I'm not sure if the GBA ports are what you should wait for. They'd probably be the same price as the SNES originals, but I don't really see much of a reason to get them over the SNES ones. I haven't played them firsthand, but from what I've seen and experienced, the GBA just doesn't handle SNES ports all that gracefully. The colors tend to be over-saturated and the sound chip is much weaker. Yeah, the GBA ports of the DKC trilogy were...not all that great. I mean, they had new modes and features, and the gameplay is all there intact. But it seems as if they designed those games - all of them - for the ORIGINAL GBA. The non-backlit/frontlit version. So all the colors are totally washed out and super-bright. Which...I mean, it looks fine on the first GBA, but pretty terrible on literally everything else. Not even the Gameboy Player can fix that color palette.